We thought you would want to know that Ford is working hard on making all the necessary repairs to the Police Interceptor Utility cars having problems with carbon monoxide coming into the cabin of the car. 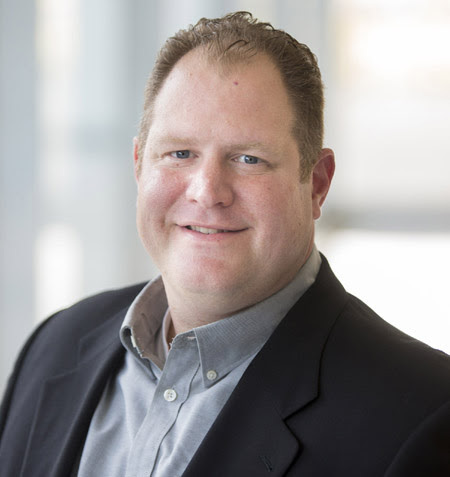 Here’s an update from Bill Gubing, the chief engineer for the Ford Explorer. Ford Motor Company wants you to know that its engineering teams continue working with law enforcement agencies in their communities to address carbon monoxide concerns in some Ford Police Interceptor Utility vehicle. Ford has worked side-by-side with more than a dozen police agencies nationwide to inspect and repair more than 50 vehicles in cities and towns, such as Auburn, Massachusetts; and Galveston, Texas. While there have been reports of exhaust odors in some non-police Explorers, those instances are unrelated to reports of carbon monoxide described by some police departments. If you notice your vehicle has an odor, customers should bring it to a Ford dealer who can address the issue. Ford’s investigation into this matter continues. However, while inspecting police vehicles throughout the country, company engineers consistently have found similar types of holes and unsealed spaces in the back of some the Police Interceptor Utility vehicles that had police equipment installed after leaving Ford’s factory. When a police or fire department routinely installs customized emergency lighting, radios and other equipment, they have to drill wiring access holes into the rear of the vehicle. If the holes are not properly sealed, it creates openings where exhaust could enter the cabin. 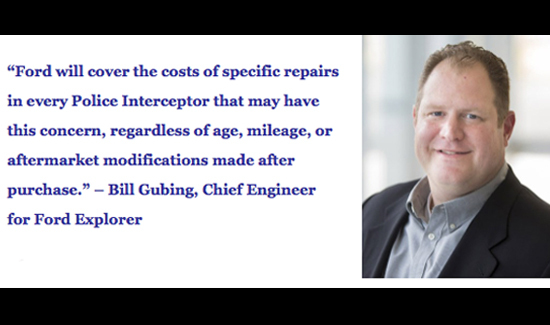 To address this serious problem, Ford will cover the costs of specific repairs in every Police Interceptor Utility SUV that may have this concern, regardless of age, mileage or aftermarket modifications made after the purchase. 1. Check and seal off the rear of the vehicle where exhaust can enter. 2. Provide a new air conditioning calibration that brings in more fresh air during heavy acceleration typical of police driving. 3. Check for engine codes that could indicate a damaged exhaust manifold. Ford will continue investigating all reports from its law enforcement customers, including the exhaust manifold issue referenced by National Highway Traffic Safety Administration. If a customer believes exhaust gases are coming inside the vehicle, they should bring it to a Ford dealer, who is equipped to assess the vehicle and address the issue. Customers also can call a dedicated hotline at 888-260-5575. The Ford Motor Company is a global company based in Dearborn, Michigan. The company designs, manufactures, markets and services a full line of Ford cars, trucks, SUVs, electrified vehicles and Lincoln luxury vehicles, provides financial services through Ford Motor Credit Company. Ford employs over 200,000 people around the world and is taking a leadership position in electrification, autonomous vehicles and mobility solutions.